The candles were lit, the musicians in tune, the kids made it down the aisle without mishap; a perfect day for a wedding. Standing before the bishop, surrounded by friends and family, two simple words marked a sacred-moment, a turning point in my life. My husband and I, like any couple, had been planning the details of for our wedding for months. But no amount of planning, plotting or prearranging could have prepared us for the thunderous response of God’s people. “We will!” Two simple words that we in the Episcopal Church often take for granted, but words that contain far more than that simple assent. Those two words, spoken intentionally and boldly, conveyed to my husband and I that we were good enough. They spoke more than the assent of the people of God, they carried the weight of being recognized, seen and affirmed as a full member of the household of God. Those two words asserted that we were indeed made in the image and likeness of God, marked as Christ’s own and valued as God’s beloved. The power of liturgy is found not only in the words of our worship, but in the lifting up of persons, times and places that have allowed us to be a blessing, one to another. Many LGBTQI people have often been relegated to second class citizenship in the world and in the church. We have at times been told directly or indirectly that our love, our lives, our families are not good enough; that we are somehow deviant, deficient or defective. Two words changed all that for my husband and me. In June 2015, the Episcopal Church, gathered at General Convention, took a bold step forward in affirming the full inclusion and dignity of LGBTQI persons in the life of the church. With the creation, preparation and approval for trial use of new rites for marriage, a fundamental shift occurred that allowed the church to live more fully in our Baptismal Covenant. As Episcopalians, we affirm the worth and dignity of everyone made in the image of God as they emerge from the waters of baptism. At every baptism the presider asks “Will you who witness these vows do all in your power to support these persons in their life in Christ?” The simple response, “We will,” consecrates the newly minted Christian into a community of blessing. When we ask this question of the people they are speaking for the church, the body of Christ. The same is true for the new marriage rites of the Episcopal Church. 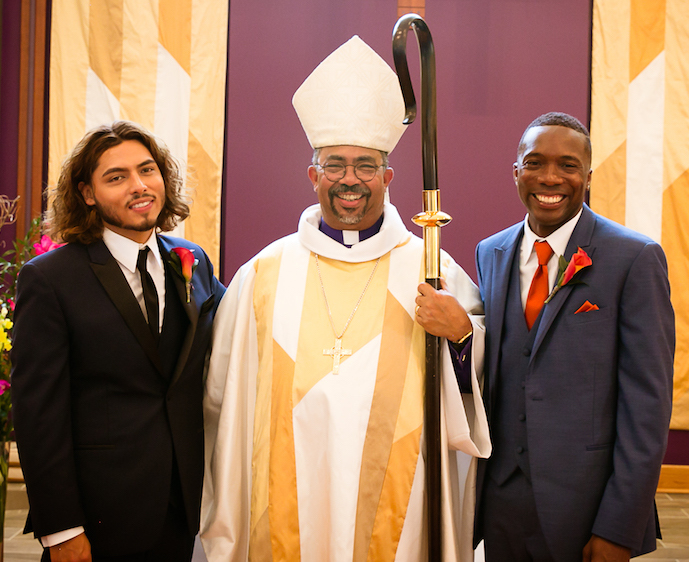 By allowing for the witnessing and blessing of a marriage, regardless of the sexual orientation of the couple, the church is confirming and affirming the inherent dignity of every person made in the Triune image. At the heart of the rites of marriage rests the promises of our Baptism. Promises that call us to seek and serve Christ in the world through respecting the dignity of every human being. Promises that allow us to claim our vocation as followers of Jesus. The profound act of standing before God and the people of God and being blessed by the consent of the church is a transformative moment in the life of any couple. The Episcopal Church must now claim it’s prophetic mantle and live more fully into our Baptismal vows with the passage of Resolution A085. We must make marriage available to all couples in the Episcopal Church. Anything less would be to disregard the vows we make each time we gather at the font. As the church, we set aside these moments and recognize them as transformative sacred-moments. I never thought that two simple words in a newly created marriage rite would have the power to convey so much; so much love, so much joy, so much hope, so much blessing. The Rev. Deon Johnson, a deputy from Michigan, is a liturgical consultant and rector of St. Paul’s Church in Brighton, Michigan.